I’m breaking the very necessary radio silence that occurred over November. Nanowrimo, as ever, took up a great deal of time, and cruel as it may seem, something had to give. There will be a fat dose of Speakeasy goodness coming up over the next couple of weeks in the form of Xmas treats–keep your ears peeled for that. In the mean time, I’m delighted to host a new longform piece by our friend, the mighty Chris Rogers. He promised us something on the influential Patlabor series, and he’s come through in spades. Over the next two posts, he explores the themes, history and influence of a film series that would come to help define the visual grammar of Japanese SF as it approached the 21st century. Ten years into the future; a forest outside Tokyo. Night. From the dark sky, massive armoured bipedal machines descend by cargo parachute and retro jets to join soldiers, their faces set, moving quietly through the trees. A stop line is formed; weapons are readied. A rumble of noise becomes a roar as their foe, a prototype flying tank, crashes through the undergrowth towards them. It opens fire; the soldiers reply. Gunfire tears into the tank, but it doesn’t stop. The automatic cannon of the bipeds adds to the unit’s firepower, and now helicopters dive in to attack with missiles. Finally, a spider’s web of cable strung across its path snares the shattered tank and brings it to a halt. As it lies immobile, soldiers close in, warily. They scramble on to the hull and level their guns, ready to confront the renegade crew. The tank’s hatch is forced open. The cockpit is empty. So begins the anime feature Patlabor the Movie (1989), an absorbing and intelligent techno-thriller that was a great success in its home country but also helped popularise anime in the West. The film became the first of a trilogy, each of which explored the same carefully-realised societal landscape but from very different angles. Thus Patlabor 2 the Movie (1993) is a densely-plotted political drama that audaciously draws on Japan’s troubled history to posit a scenario uncomfortably close to reality, whilst WXIII: Patlabor the Movie 3 (2002) is a sombre side story set between the two earlier productions that fuses characterful introspection with classic monster movie tropes. All three feature narrative complexity, incisive cultural critiques and often exquisite execution to form an intriguing, multifaceted commentary on today’s Japan. This is perhaps surprising given the genesis of Patlabor as an essentially light-hearted Original Animation Video (OAV) series. Devised by Yuuki Masami of creative collective Headgear and released the year before the first film, it was intended for a teenage audience and was complemented by manga and novel versions. The concepts at the heart of the OAV, however, suggested the potential for a more adult iteration. The involvement of Headgear director Oshii Mamoru in the series must also have made this likely. Oshii would later bring Shirow Masamune’s Ghost in the Shell to the screen as well as his own original live action virtual reality drama Avalon, reflecting his long-standing interest in the dissection of worlds, meditations on life and the interface between the two. With a plot that built on two episodes of the six-part OAV, production was duly begun on a theatrical spin-off that would bring about this tonal shift. It would, though, retain the series’ depiction of a near-future Japan that seemed, in the economic boom years of the late 1980s, at the very least possible, if not actually desirable. To accommodate Tokyo’s ever-expanding population, overcome the lack of space brought about by her geographical situation and protect against melting polar ice caps, Project Babylon is conceived: a great tidal barrage stretching across Tokyo Bay, allowing the entire extent of the Bay within to be emptied and reclaimed for settlement (in real life, this has already happened to about a fifth of the Bay’s original area). Making this Herculean endeavour possible is a new construction tool – eight-metre-tall machines of varying design able to walk, lift and manipulate items with the freedom of a human but on a vastly increased scale, machines called labors (the American spelling is deliberate and relevant, as will be seen). Labors are not robots; operated by a pilot seated in the chest cavity, they are an evolution of the excavator, bulldozer and crane in use today, and transform the capabilities of any workforce. With man’s reach extended in this way, and more than 3,500 labors – half of the total number in Japan – maintained and stabled on a vast maintenance platform in the Bay called the Ark, Project Babylon is under way. But although useful, labors also bring problems. An angry or drunk worker is a danger only to himself, but that same worker piloting a labor could destroy a city block. To fight such labor crime, the Tokyo Metropolitan Police Department is equipped with special patrol labors, the derived portmanteau word ‘patlabor’ giving the series its name. Their polished white armour and black detailing reflect the livery of Japanese police cars (and their spiritual ancestors from America), though with its broad shoulder pads, a labor-scaled revolver in a concealed leg holster and a baton, the Shinohara Industries AV-98 Ingram patlabor – the iconic image of the Patlabor universe – is also an exaggerated version of the uniformed street cop common to both countries. The works follow the lives and missions of personnel from the TMPD’s Special Vehicle (i.e. labor) Section 2, based on its own piece of landfill overlooking the Bay. The Section’s split into two Divisions led by captains of differing personalities – easy-going Kiichi Gotoh and efficient Shinobu Nagumo – prefigures the tensions between ideologies essayed in the first pair of films. He will be central to the first film, she to the second. This, then, was a fictionalised but highly credible setting that would serve as a basis for more mature stories merging the past, present and future of Japan. 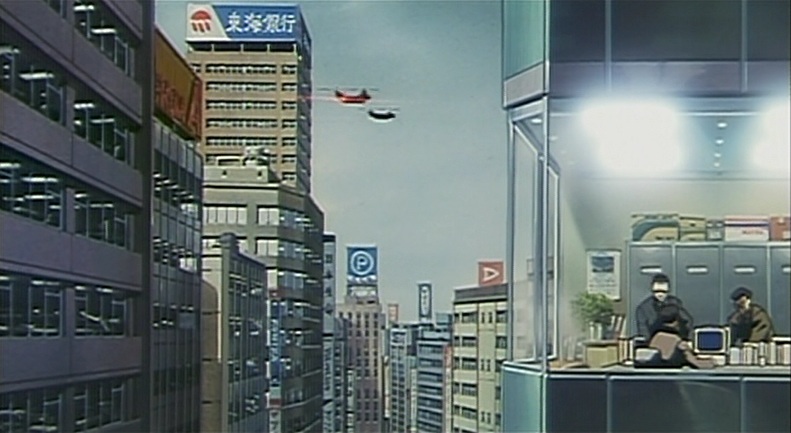 In Patlabor the Movie, a new computer operating system called HOS is installed in each of the Project Babylon labors to further boost output. All seems well. 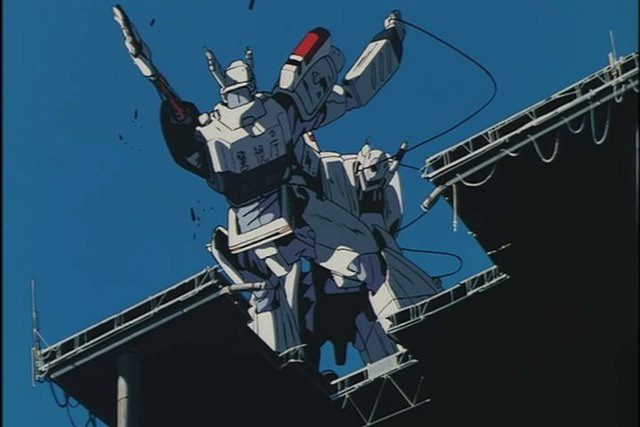 And yet that opening sequence hints at a disturbing problem, confirmed in a later scene in which SV2 battles a rampaging construction labor that cuts a swathe through the city despite its pilot being removed from the cockpit and even after multiple hits from patlabor cryogenic shells. The cause is eventually discovered by two young SV2 officers: a computer virus, buried in every copy of HOS, that causes the infected labor to start up with no human pilot aboard, act according to its own whim, and continue until it is destroyed. But this is not terrorism, or extortion, or even corporate espionage. It is revenge, the work of Eiichi Hova, HOS’s creator, a brilliant but disaffected software engineer. The question is why, and the answer supplies the film’s melancholic middle act. Gotoh’s detective friend Matsui and his partner search for clues to Hova’s actions, wandering the back streets of old Tokyo one summer afternoon. They follow Hova’s trail via a dozen previous addresses, moving through narrow alleyways hung with washing, clambering across culverts and exploring derelict warehouses. Whether in decaying tenement blocks or traditional wooden houses, each of Hova’s residences was in a district hemmed in by new skyscrapers and now empty and abandoned. At one site, the foreman hurries them out and the pair watch as a demolition labor tears the building apart. Matsui briefs Gotoh on his conclusions later the same day under an evening sky, the setting sun reflecting on the waters of the Bay. For Hova, the very technology he serves came to stand not for progress but a disastrous abandonment of tradition and a headlong flight into technological servitude. The corrupted HOS program is Hova’s response, sowing chaos and destruction and plunging man into a new dark age. Chillingly Hova himself, secure in his arrogance, takes his own life even before his plan bears fruit. With SV2 personnel fishing off a jetty as cargo ships slip along the horizon sounding their mournful foghorns, the audience is invited to make its own assessment of a world where man never stops and where the new pushes out the old. Discovery of the trigger for the virus leads the men and women of SV2 to cross a stormy Bay one night to the Ark in a race to dismantle it before the dormant labors within awake. The outcome of the inevitable battle that follows is kept in doubt through knowledge that the new Type Zero patlabor is also equipped with the new HOS; will it, too, be affected, and turn rogue? Additional tension arises from detection of a single life reading – Hova’s ghost, perhaps – on the roof of the supposedly deserted Ark, a genuinely chilling moment that may owe something to similar scenes in Aliens (Oshiii is a declared admirer of James Cameron). A final stand-off equals Hollywood’s affinity for spectacle whilst including the same touches of lyricism that are seen throughout the film, as the sun rises on the victor. 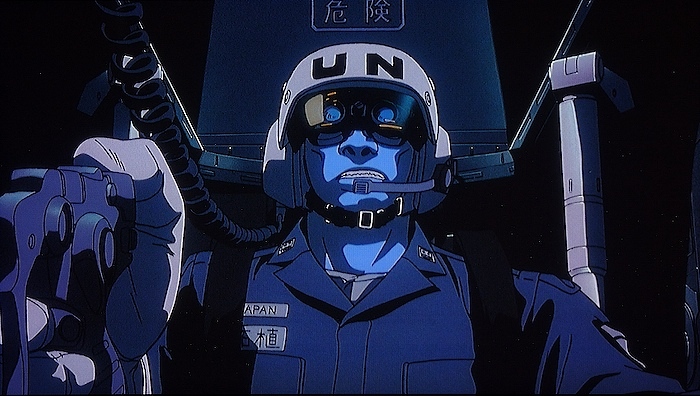 It can be seen that Patlabor the Movie is rich in references to Japan’s history, in particular its plight during world war two and the years of humiliating yet hugely beneficial occupation by the victorious power that followed. Indeed exploring the complex legacy of this period is arguably the surtext of the film, even above and beyond its genre commitments. The putative destruction of Tokyo threatened by Hova’s plan echoes that visited on the city by American bombing in the closing months of the 1941-45 conflict, whilst the script both celebrates and subverts the advanced technology that arose from that legacy of occupation and reconstruction. This last was an especially bold statement for Japanese writers to make at a time when their country’s post-war economic miracle, based almost entirely on the design, development and manufacture of domestic and industrial electronics, seemed never-ending. That said, it could be argued that such ambiguity has long been resident in Japan, a country that has always maintained a balance between tradition and modernity. The old and the new also collide in the attitudes and skills of SV2’s team members and their relationships with their families. 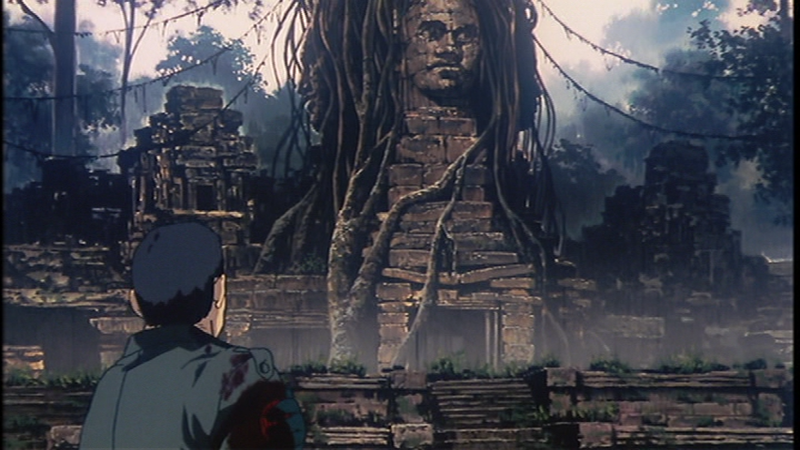 British anime commentator Jonathan Clements, meanwhile, has noted that Oshii was simply attracted to the idea of a depicting a world in which Japan has to respond to failure of one of the pillars of its success. Of course it is humanity that is flawed in the Patlabor world, not technology – indeed, we are often invited to feel sympathy for the machines themselves courtesy of several small touches: SV2 pilot Izumi’s affection for her Ingram, nicknamed as it is after a succession of her pets, all called Alphonse; colleague Clancy’s cognizance of the potentially fatal weakness at the heart of her own Type Zero labor; and its agonisingly drawn-out ‘execution’ in the climactic sequence. The first sequel, Patlabor 2 the Movie, develops these themes, making the dangers posed by ambition and disaffection more explicit and strengthening the differences and similarities between Gotoh and Nagumo in its depiction of their responses. Its script also takes Japanese self-examination significantly further with some ambitious and provocative allusions to the country’s more recent history. The pre-credits sequence is no less dramatic than that of the original film and is set in the same year, 1999. A squadron of Japanese military labors, part of a UN peacekeeping operation to an un-named South East Asian state, is confronted by forces advancing through the jungle toward them. With a minefield behind them Yukihito Tsuge, the unit’s commander, requests permission to engage but is told to hold his fire. As the oncoming threat increases, Tsuge repeats his request but is again rebuffed with the promise of reinforcements. Suddenly incoming missiles blast one labor apart and damage Tsuge’s own machine. More and more missiles slam into the labors, cutting them to pieces. Still denied permission to retaliate but unable to watch his unit be destroyed, Tsuge releases the safety on his labor’s gun and pulls the trigger. Cannon shells arc toward the enemy vehicle, destroying it, but a single final missile drifts lazily toward Tsuge’s labor as if in a dream… Minutes or perhaps hours later Tsuge, his crews dead, his shattered labor stranded, emerges into the stifling heat of a tropical afternoon, bloodied and shaken. He turns and stares at a vast stone Buddha behind him, its ancient face serene and unknowable. Flash-forward nearly three years to January 2002. Project Babylon has been completed, and Nagumo is speaking at a conference on labor crime outside Tokyo. In the lift afterwards, she meets some former colleagues – all were once students together under Tsuge, at that time a pioneering labor strategist, Nagumo’s mentor, and her lover. She politely deflects a clumsy comment about their relationship, her mind elsewhere as she watches the vastness of the city laid out below. Driving home that evening, Nagumo encounters a traffic jam leading to the Yokohama Bay Bridge; accessing the local police frequency, she is informed that a bomb threat has been called in on a car parked on the bridge. She waits, patiently and unconcerned – after all, Japan hasn’t been subject to terrorist attack for years. Police labors move in to investigate, but only the audience can see an air-to-surface missile streaking toward the bridge. It climbs, then dives, homing at supersonic speed on the car. The resulting explosion blows a vast hole in the bridge’s road deck, and the government’s feeling of security. When the media obtain footage of what appears to be a Japanese military aircraft in the area at the time, the disturbing possibility of an accident emerges. But when, shortly afterward, an air defence alert sees two flights of aircraft scrambled to intercept a trio of Japanese fighters on an apparent course to attack their own capital, the stakes are raised much higher. Is this another accident? Terrorism? A coup? As the aircraft close with each other, the increasingly panicked interceptor pilots call for a target whilst fearing that they themselves will be hit. Air traffic controllers scramble to clear civilian traffic over Narita airport in scenes conceived a decade before the events of 9/11. As the defenders are given permission to engage and shoot-down their own colleagues a catastrophic conflict in the skies above Tokyo seems unavoidable, until it is revealed that – shockingly – both pairs of defence fighters are actually heading toward each other: their ‘enemy’ is a ghost, a false echo planted on a radar screen by a thoroughly convincing manipulation of the Japanese air defence network. Gotoh and Nagumo are approached by Arakawa, a government intelligence operative, who suggests a culprit even more unnerving than a unit of Japan’s own protectors – a clandestine group of politicians, American military advisors and defence contractors searching for a new enemy after the end of the Cold War. Feeling threatened by Japan’s resolutely pacifist position, they used an American jet with a duped pilot and a hacker to provoke the country into action, fuelling a fresh arms race. It may even lead to America beginning a new, repressive occupation of Japan, to the group’s advantage. Arakawa also has a lead, a senior member of the dissident group with an additional motive – Tsuge. By creating confusion and fear and pitting the civilian powers against the military, Arakawa states, Nagumo’s former lover wishes to put the Japanese people under the same conditions he was forced to endure when he was left alone and unsupported on his UN mission. As Arakawa says, seeking SV2’s help to apprehend Tsuge without creating an international incident, “Tsuge saw his troops killed under civilian control. So now he’s placed Japan under the same conditions.” He wants, adds Arakawa, “to see what kind of war we create under the same rules as the one he lost his men under.” A Gotoh later remarks, “It’s terrorism under the guise of a coup”. Arakawa and Gotoh clash from the start, the policeman seeing something oblique and underhand in the spy’s manner, and as their conversation – delivered in voice-over, as scenes of the city unfold during a boat journey – touches on Japan’s difficult past, the opposition between them grows. Arakawa talks of an unjust peace, the latter maintained by having their wars elsewhere, and is bitter at those proxy conflicts and his own country’s tacit support for them – “Japan’s prosperity in built on the corpses from those wars.” Gotoh, meanwhile, believes an unjust peace is preferable to a just war. Arakawa’s most striking phrase – and a clue to his real status – comes as he reveals his fears that “This country will have to start all over, just like at the end of world war two.” Here lies the true core of the film, setting out the complicated accommodation that took place in the mind of every Japanese after 1945 and which has shaped her ever since. As Tsuge’s scheme plays out, both sides take positions against each other. The army, flouting orders to stay in their barracks for fear of insurrection, deploys tanks and military labors, stationing them under highway bridges and in the streets. Terrified of outside intervention by America, the government in turn orders the police to surround army bases. The winter snows begin to fall, and the citizens of Tokyo – alarmed, bemused, uncaring – mug for the television cameras, wave or walk by, huddled against the cold. In a country of masked meanings, Gotoh and Nagumo are sucked into a spiral of paranoia and conflicted loyalty, further clouded by the awkwardness of Nagumo’s position as acting commander of SV2 and her latent feelings for Tsuge. With tension at breaking point, the next phase of his plan commences – actual attacks on strategic points across the city. 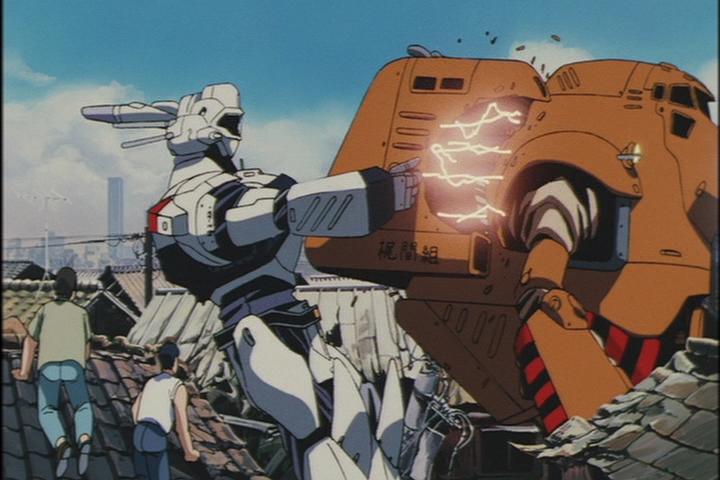 Helicopters destroy bridges, communications towers and much of the patlabor complement. The city is helpless, cut off, ripe for the picking. When the evidence points to a remote landfill island as the base of Tsuge’s operations, SV2 must once more penetrate the heart of darkness to collapse a plot, this time facing not simple construction labors but armed remote-control robots. The climax will involve the unmasking of Arakawa, and a very personal meeting for Nagumo. 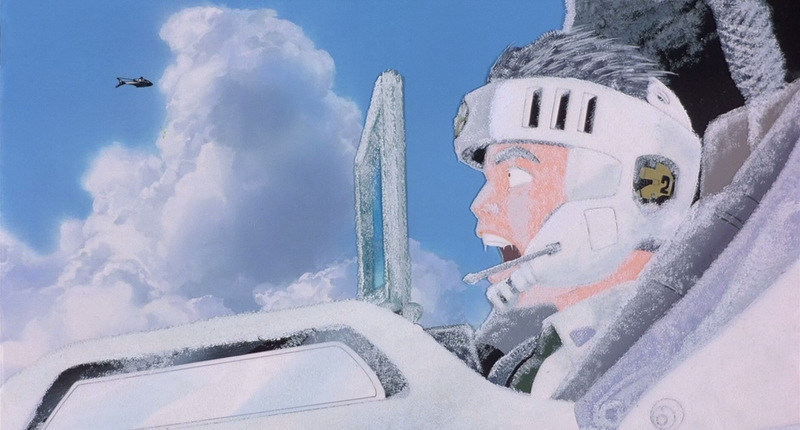 In part two, Chris explores the deeper historical and political threads running through Patlabor 2 the Movie, the architectural and technical aesthetic of both films and the dark third and final instalment, the monster movie WXIII: Patlabor the Movie 3. He also offers some thoughts on the films’ relevance to today’s Japan. I love “Patlabor” specially this two movies, I watch them again from time to time but there is so much to them that I didn’t know. Thank you for this great two articles.